Humor--I think finding humor in life should be mandatory and try to find something to laugh about every day. 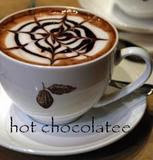 Hot Chocolate--I prefer dark and since I'm drinking it in the first place, better add some marshmallows. 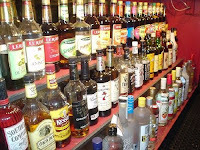 Hard Liquor--it just makes life better. Enough said. Home -- Dorothy had it right, there really is no place like home -- both the physical place and the feeling you have when you're with your family or friends. Hot Dogs -- Nathan's or Hebrew National. I know, I know, some people think they are gross but nothing beats a hot dog cooked over an open fire. Chances are if there is an open fire, my friends and beer will be there as well (which in truth I like more than hot dogs, but those things don't start with "H"). Hands down the best way to spend a Friday or Saturday night. Hyacinths -- One of my favorite flowers, especially the lavender and blue shades. Hope--the belief that what you want can be attained, that things will turn out for the best, that things can always get better. Handbags--I'm a girl, this is a given. I love handbags and when there is a sale I cannot be held responsible. Any shape, size, or color you name it chances are pretty good that I will love it. While I have a lot of different bags, I usually carry the same one because I am too lazy to switch it out with another one. Hardback Books--Yes, I know paperbacks are more cost efficient but there is just something about a hardback, especially if its an old book or leather bound. Its the book worm in me. Happiness--In my opinion, its as vital as air and water. Being happy is something we all need, deserve and too many of us sacrifice for one reason or another. Lately I am on a mission to reexamine and reclaim what makes me happy. Whew, its harder to come up with ten things that start with the letter "H" than one would think. Now, who wants to play? Its fun, I promise. =) Leave me a comment if you want to partake and I'll give you a letter. Hardback books are always worth the extra bucks. The other ones fall apart and get all ugly. I would have also included hammocks. I have one in our patio and that's why I lay when I want to relax/read/listen to music. Love it. I figured that hardback books are worth it after I bought the fourth copy of my favorite paperback book. I've never looked back since then. Mmmm, hot chocolate. I have to say that I prefer paperback books, though. I always seem to fall asleep with hardback books on my face. Great list! I love hotdogs too but, they have to be grilled or over a fire. That's the only way to go! Personally I like my hot dogs best when they start getting burnt on the outside then I just slap it on a bun with some mustard... perfection! i have a shameless love for hotdogs (especially hebrew nat'l!!!) that i don't even try to hide. best hot dog ever? a Chilean "completo"--hoagie roll, hot dog, mashed avocado, diced tomatoes, mayo, and kraut. i know it sounds horrible, but is is DELICIOUS!!!! is it bad that i wish i had a hard liquor drink, a hot dog and a hardback book right now? oh and that i was laying on my couch too. That reminds me, I have a letter I was supposed to post quite awhile ago too! =) I love hardcover books too! Hot Dogs- oh, nothing like them, especially at a baseball game with a cold beer in hand.